Situated in a small, private, quaint complex, Glencree Cottage is a lovely, Non-Smoking townhouse with simple, pine furnishings. The kitchen has just been completely renovated with an induction cooktop, wall oven, and washer / dryer and other modern conveniences set near the seaside in County Wicklow, Ireland. About one and a quarter hours from Dublin Airport, this puts you far enough away from the hustle and bustle but close enough to go into Dublin's City Center and explore. Only 20 min's from the DART Commuter rail line in Greystones. Directly across the road from the townhouse is Blainroe Golf Club - an 18-hole golf course with spectacular views of the Irish Sea and coastline. There is access to a private, family beach located across the road near the golf course; it is a lovely spot tucked away in a secluded cove. Hiking, biking, and fishing are right at your door step. Glencree Cottage is in an excellent location for sightseeing and day trips to Dublin City. Dublin is 50 minutes by car or you can go to the City via the DART (the train/nearest station in Greystones, Co. Wicklow) to avoid the hassle of parking and driving in Ireland's largest and busiest city. On your return to Glencree Cottage, you can enjoy all the comforts of home, including an open fireplace to wind down, and the peace of the Irish seaside. A variety of tourist destinations are a stones throw from Glencree such as: Glendalough, Powerscourt - Manor House and Gardens, Brittas Bay. The 3000 B.C. druid ruins at Newgrange ,are a must see located in Co Meath 1 1/2 hrs from Wicklow town. In less than one hour, you can go from the Wicklow Hills to the mountains surrounding Dublin; to the seaside with lovely villages, towns and beautiful scenery all tucked in between. We have maps and travel books at the townhouse for use during your stay. Additionally, several of our friends and family who live nearby would be happy to assist you with any questions or issues you may have during your stay at Glencree Cottage. More than a hotel room, the townhouse allows you to spread out a bit, cook your own meals, and enjoy the comforts of home after a day of sightseeing. I am originally from Dublin and my family is located in the Wicklow area. 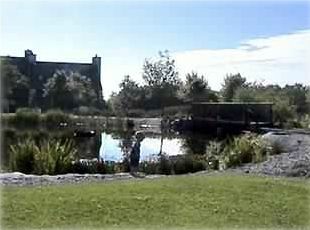 To enjoy the peaceful area and be close to all that Wick;low and Dublin has to offer. Golf and a lovely village to enjoy the hospitality and comforts of living in a quiet and relaxing environment. Shower with bathtub and sink, toilet and built in hairdryer. Deeded access to a private cove opposite unit. Course is a 8 or 9 iron from #20 depending on your club selection ! Burns wood Turf and small amounts of Coal! Newly renovated kitchen with lots of counter space and storage. Across the road~ 8 iron away! Microwave & Oven, Portable DVD Player, IPod charger and speaker, Iron, Blowdryer, Cooking Utensils, Glassware, Dishes, Cutlery, Bedding Linens & Towels are provided,2 Sets of Golf Clubs ,and 1 Bike. No Smoking Please! Thank you Ronan and Emma for ensuring a cozy stay. The house had all the kitchen and bathroom accessories needed for a smooth visit. We loved the neighborhood and proximity to the beach and community walking trails. Wicklow is a cute town, but this house is convenient for traveling around as well. When we arrived, the home was immaculate, warm, and Emma had even left bread, milk, and cheese in the fridge for us with a kind note. We are still dreaming of our stay and can't wait to return! Thank you so much for such a lovely review of my place. I have just put a new single day bed upstairs a week ago.Perhaps you will try it out on your next visit. Looking forward to having you enjoy Blainroe again..
Small cottage but lovely, well equpped kitchen, large light bedroom and bathroom. Lounge a bit dark. Near Wicklow town which is really quaint. 2 handy supermarkets. Small beach close by, quiet and beautiful. Caught train to Greystones, town near the sea with lots of nice shops and cafe's. Dublin about 40 mins by car - great to visit. Glendalough also beautiful. Nice base with plenty of places to visit. Comfortable beds, suitable accommodation for 3. Nichole, thank you for that lovely review, please contact me as soon as possible so I can block those dates you are coming over for next year. We really thought we had picked a good location for our stay in the Wicklow mountains and were really looking forward to it. However, upon our arrival it was not what we had hoped for, the house was dark and cold, the floor was dirty, there were wet sheets in the washing machine, it did not look like the furniture had been dusted for months, the couch was dirty, and we found pubic hairs on the sheets in the beds! Very disappointed!! I went next door to find the person who was in charge of the maintenance and see about the heat and lights, we found out the owner was 3,000 miles away. I told told the lady we were not happy about the area and would not be staying, I then contacted the owner via email and asked if we could be reimbursed for some for about half of our money because we were not happy with the condition of the house and the area was not what we were looking for during our stay. The owner said he would reimburse us Ninety (basically the damage deposit) of the almost five hundred I spent on the rental house, to say the least I was not happy! The owner explained he had overhead money he need to use and was unable to rent the house for the four nights we were scheduled to be there, I totally understand that, but from what I could tell, nobody was looking to rent the house during our scheduled time there, plus again I was willing to accept half of my rent back which was two hundred fifty which would have more than covered his overhead money for four nights. Once I found out about what he would reimburse me ninety I emailed him again and asked for at least half back, he never responded to me and he only reimbursed me the ninety. We are very, very disappointed and extremely upset on this and how the rental looked and felt, plus on how the owner handled this situation, I would tell anyone to not use this place to stay, the owner was extremely rude and accusatory and not willing to work wit us at all! Watch the moon rise from your pillow, fall asleep by starlight, waken to birdsong. Be amazed by swallows flying inches from you as they catch insects. Observe the chicks peeping from the nests at the back of the golf club. The two of us stayed in your cosy cottage and felt as if we had been living there for ages. It was an ideal basis for all our activities in the county Wicklow and Dublin. We were prepared to believe the weather forecast on the Internet but fortunately it has always been a bit better than expected.